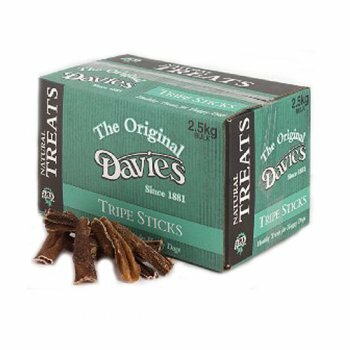 Davies Tripe sticks are an original, tasty and healthy treat for your dog. They are completely free of wheat gluten, added colours and preservatives. They also contain no cereals, fish, soya, milk products, sugar or added salt. Below are some recent questions we've received regarding Davies Tripe Sticks Dog Treats, including answers from our team. Are these tripe sticks sourced in UK ? Thanks for your question. The Davies Tripe Sticks are sourced in Denmark.